A cartoon in your edition on March 28 appeared to mock Jesus or someone exalted for Catholics, such as a saint. That is, at best, disrespectful. Although I am a follower of Lord Buddha, it is a serious thing to mock what many people consider sacred. Editor's note: The cartoon in question was intended to illustrate the contrast between St. Joseph's espoused ideals and the alleged conduct of St. Joseph Hospital in treating a transgender patient. 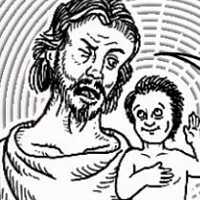 It was not intended to mock Jesus or St. Joseph and the Journal regrets if anyone found the cartoon to be disrespectful.